Let's Talk Grain Silos. Really. How Old Should My Money Be? Your Money Isn’t Old Enough. Imagine never having to worry about paying a bill. Not because you won the lottery. But because you were simply far enough ahead that the money to pay your bill arrived a few weeks before the bill itself. You’d sleep well at night, wouldn’t you? Too many people find themselves in the opposite situation – with a pile of bills, waiting for more money to arrive. You constantly feel a bit too close to the financial edge, where one unexpected expense can throw you completely off course. But unexpected expenses are a fact of life. You take money in, but your sigh of relief fades quickly, since that money is already spoken for. You pay off almost-overdue obligations, do a few things you have been putting off, and before you know it, you’re waiting again for the next paycheck. Those days of waiting are exhausting. This is the paycheck-to-paycheck cycle. It doesn’t matter if you make a lot of money, you can still be stuck in the paycheck-to-paycheck cycle. As long as your income barely covers your expenses, whether that is $1,000 or $10,000, you’re stuck. As long as you find yourself juggling and timing your spending, you’re stuck. The gap between when you earn money and when you spend it is too small, and this is the root cause of the paycheck-to-paycheck cycle. Your dollars barely have a chance to get settled in your account before they’re out the door again. Expand the time between receiving and spending your money. Instead of spending money that arrived yesterday, you can spend last week’s money. And then last month’s money. You’ll be secure. You’ll have the stability and flexibility to respond to whatever comes your way. Let’s Talk Grain Silos. Really. 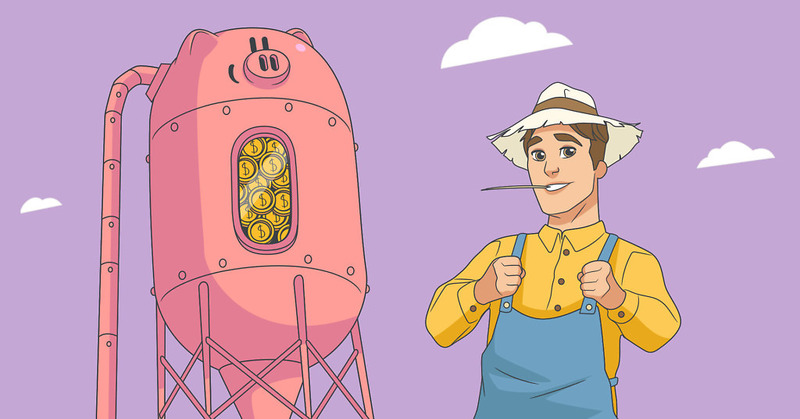 The idea behind aging your money has been hiding in a grain silo. After being harvested, grain is stored in silos. When grain is added to a silo, it is poured in the top and lands on any grain already there. When you remove grain from a silo, you take it out from the bottom. Over time, grain sinks gradually through the silo, with the oldest grain always on the bottom, ready to be used. Imagine you and your family depend on this grain for your livelihood. It’s your security. When there’s no grain, there’s nothing to eat. And let’s say there’s not a lot of grain in your silo. You’re taking it out nearly as fast as you’re putting it in. It feels like you’re close to the edge. One bad harvest, and you might not have enough grain. Maybe you pour new grain in on Monday, but it has already reached the bottom by Wednesday when you take some out. Your grain is only two days old. If you don’t find some new grain soon, you’re going to run out. You’re going to be hungry. Maybe you start harvesting more grain or simply being more careful with how much grain you are using. You start putting in more grain than you’re taking out. Grain moves more slowly through your silo. The grain you get on a Saturday was put in on Monday. Your grain is five days old. You’re a little more secure. Imagine continuing this cycle of taking out less than you put in. The grain is being stacked higher and higher in the silo, meaning it will take longer and longer for your grain to work its way down to the bottom of the silo. Your grain is older. You’re more secure. Eventually it takes two weeks, three weeks, or even a month for your grain to reach the bottom. Who knows, maybe you get to the point where you are eating last year’s grain. Your grain is old, and you’re protected from life’s ups and downs. Money in your budget works the same way. Imagine new money entering your budget, but it lands on top of the dollars that were already there. The dollars that were already there are spent first. The new money ages as it waits. As you spend less than you earn, it takes your money longer and longer to move through your budget (to sink to the bottom of the silo) and be spent. When your money is older, you have more security, predictability, and flexibility. When you have a silo full of grain, you can endure a terrible growing season and still feed your family. When you have a cereal dispenser chock-full to the top, you can endure a snowstorm (or just a day you don’t feel like getting dressed) without hiking to the grocery store. You know where your next meal will come from. You’re more secure and your life is more predictable. What happens when your budget is full of old money? You sleep better at night. You’re more secure and your life is more predictable. You know how you’re going to pay your next bill or afford the next car repair. And the next one, and the next one. Thousands of little tips and tricks that promise to deliver you to the financial promised land won’t do it. Instead, the answer is simple. Shockingly simple. In fact, you’ve heard it before: Consistently spend less than you earn. Consistently spend less than you earn and you will naturally create a longer and longer delay between when you receive money and when you spend it. How do you make sure you spend less than you earn? It’s not about deprivation. It’s about prioritization, the essence of YNAB’s first three rules. When you give every dollar a job, your priorities become crystal clear. You’re more thoughtful about your spending. Because you’re working only with the money you have on hand right now, you don’t spend more than you have. When you embrace your true expenses, you anticipate larger expenses and life’s inevitable ups and downs. When they come, you don’t have to dip into reserves or borrow – the money is there for you. When you roll with the punches, you adjust in real time. Small mistakes don’t have the chance to become big mistakes. You stay in the game. With these three rules and habits firmly in place, your money will age all by itself. You might find yourself earning money and not knowing what to do with it because, well, everything is covered. Instead of having seven potential uses for each dollar, you’ve got a dollar looking for a job. Imagine saying to yourself, I don’t need this dollar at all this month. Maybe it becomes next month’s rent or insurance payment … or even for the month after. Align it with your priorities. No matter what, it’s growing older, and you’re growing more secure. It all sounds good, doesn’t it? So good you wonder why you never did it before. But your money is growing because you have a budget. Because you’re letting it sit. You are doing something. And when you make your spending decisions based on the jobs in your budget, there’s nothing to worry about. Every dollar is aligned with your priorities. To do that, some of them – maybe even a lot of them – have to sit and wait. Just let them do the job you already gave them. And maybe even enjoy it a little bit. Your money’s getting older every day. You don’t want to be spending yesterday’s money. Not last week’s either. That money isn’t old enough. But just how old should your money be? That’s a pretty simple answer for such an important question. But it’s the best place to start. If your money is a month old, you’ve effectively broken the paycheck-to-paycheck cycle, even if you’re only paid once a month. When your money is a month old, you’re probably not as dependent on that next paycheck. That’s security. You can look at the month ahead and plan with confidence. Stability. You have time to adjust and adapt when the unexpected happens. Flexibility. Once your money is a month old, it’s a good time to pause and reflect. How secure, stable, and flexible do you feel? If your income is irregular, maybe you feel like your money should be more than a month old, just like a community with infrequent harvests may want to stockpile more grain. Or a family that lives hours from the nearest grocery store might want to stockpile more Froot Loops. Do you have a low risk tolerance? Consider an older, more comfortable age of money. There may be a point, however, where your money begins to get too old. Too old? How could that be possible? What’s wrong with more security, stability, and predictability? An important part of that better tomorrow is becoming more secure and stable. But you have other goals, too – taking a family vacation, buying a house, going out to eat at a fancy (okay, overpriced) restaurant guilt-free. So if a pile of money leaves your budget because you paid for a new car with cash (who would have thought you could do that? ), sure, your money isn’t quite as old the next day. But look what you accomplished! You bought a car with cash! With your good habits in place, your money will keep on aging. Multiply Your Security with Emergency Funds. You will age your money well into a position of security and stability simply by giving every dollar a job and embracing your true expenses. You’ll receive money and realize you don’t need it in this month’s budget. You might even find you don’t need it in next month’s budget. What should you do with it? Extend. Extend your stability, security, and flexibility with some very specific jobs for your money. Begin by establishing an emergency fund. In a sense, embracing your True Expenses and budgeting for the unexpected is like having lots of little emergency funds. When you’re budgeting each month for inevitable car repairs, the bill from the mechanic six months from now won’t be an emergency at all. By anticipating large expenses specifically, you are anticipating many of the things you considered an emergency in the past. But there will still be things you can’t anticipate. If the furnace in my house is twenty years old, I should be budgeting for its replacement. If it is two years old and suddenly quits on me (five days after the warranty expires, no doubt), that’s an emergency I couldn’t anticipate. It’s a good reason to have a healthy emergency fund. And then there are the emergencies like job loss. No one wants to think about it, but will you and your family still be secure, stable, and flexible if you lose your job? Emergency funds can help you be prepared. How much of an emergency fund? This is where the particulars of your financial life come into play. A classic recommendation is three months’ salary, which is enough to guard against good-sized expenses or a job loss (and which, by the way, will make your money ninety days older, not too shabby!). Factors such as whether you own a car or a home play into this. So does your own risk tolerance, just as it does for other aspects of aging your money. The important thing is that you are expecting the unexpected. At some point, your future self will thank you for it. Imagine you have fully taken care of immediate expenses, embraced your true expenses, dealt with your debt, and built up a reserve for the truly unexpected. You’ll be sleeping better at night than you could have possibly imagined. And yet, you’ll still want to keep doing better with your money. You’ll want to extend the security, stability, and flexibility that you have been building even further. The secret to aging your money is putting in more money than you take out. And then repeating that over and over again. In retirement, though, you’re purposefully diminishing one side of that balance. You’re not working, so there’s less money coming in. And you probably have a list of things you want to do, so there’s still plenty of money going out. Retirement, then, is the ultimate True Expense. You’ve got to be preparing for it long before it happens. We recommend that you embrace your immediate true expenses first, of course, but saving for retirement is simply setting aside money you have now for a job it will do later. Much later. How much do you need for retirement? What’s the best place to save it? Those are questions that start to go well beyond budgeting. Much depends on your personal financial situation at that time. Just like budgeting for next week requires thoughtful examination of your priorities, so does saving for retirement. How long are you planning to work? When you stop, will you still be making mortgage payments? Still paying for kids’ (or grandkids’!) college tuition? Do you dream of a simple retirement? Or of traveling the world? Our recommendation is that you do some thinking about these questions and others, even if retirement feels like an impossibly long way off. Then find someone to talk to that you trust. For now, focus on the priorities in your budget now to see what you might be able to set aside. Take positive steps forward, even small ones, and evaluate your progress over time. If you’re saving for retirement, there’s a good chance you’ll end up investing. Which is also beyond the scope of your budget. That doesn’t mean some of the important principles that guide your budgeting don’t apply. Keep it simple and make sure whatever money you send there is aligned with all of your priorities. Imagine being able to pass on the security, stability, and flexibility that you have nurtured from day one on to your loved ones. Imagine money so old that you don’t even use it yourself. This is life insurance, and if there is anyone in this world who depends on you, you need it. Life insurance is a specialized purchase. We won’t give you hard and fast guidelines about how much to buy or how long to carry it. But we are in favor of keeping your finances simple and getting the most out of what you pay for. Whatever the specifics, with life insurance, you’re now putting money aside that you hope not to use (or need!) for thirty years or more, or never, because you outlive your policy. And wouldn’t that be okay? However (or whenever!) you extend aging your money, you’ll do so for the same reasons you question your spending about a $5 latte or set dollars aside for car repairs or college. You’re extending the security, stability, and flexibility, but at a much greater scale. Aging your money has a pretty long time horizon. As much as they might be your end goals, though, aging your money doesn’t start with retirement and life insurance. You will get there, but aging your money starts with smaller decisions and smaller steps. The ones you are making today. It begins when you start making proactive decisions about what you want your money to do right here and now. Using Rule One to prioritize and question your spending begins to age your money from the moment you start. It continues as you use Rule Two to set money aside for future needs and grows as those needs are further and further down the road. All the while, you’re using Rule Three to adjust as you move in the right direction. Don’t forget that old money isn’t a goal in and of itself, but it is a great way to see your progress towards all your goals. When you expand the time between receiving and spending your money, you know you’re better off. Secure. Prepared. Flexible.